Route 56 travels between Geelong and Queenscliff via Bellarine Hwy, Ocean Grove and Point Lonsdale. Route 32 – Geelong to Leopold and Route 61 – Geelong to Drysdale via Leopold & Clifton Springs also services along Bellarine Hwy to Leopold. 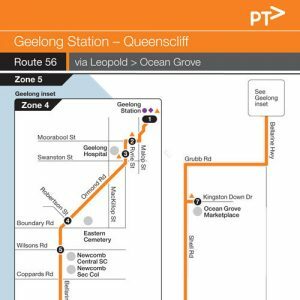 Route 55 – Geelong to Ocean Grove via Barwon Heads also services Ocean Grove. Departs from Geelong Station and runs via Railway Tce, Mercer St, Malop St, Moorabool St, Ryrie St, Sydney Pde, Ormond Rd, Bellarine Hwy, Melaluka Rd, Gateway Plaza Access Rd, Melaluka Rd, Bellarine Hwy, Grubb Rd, Shell Rd, Fellows Rd, Ocean Rd, Point Lonsdale Rd, Queenscliff Rd (Bellarine Hwy), Flinders St, Bethune St, King St, Hesse St and Wharf St to Queenscliff Ferry Terminal. Departs from Queenscliff Ferry Terminal and runs via Wharf St, Hesse St, King St, Bethune St, Flinders St, Queenscliff Rd (Bellarine Hwy), Point Lonsdale Rd, Ocean Rd, Fellows Rd, Shell Road, Ocean Grove Market Place Access Rd, Kingston Downs Dr, Shell Rd, Grubb Rd, Bellarine Hwy, Melaluka Rd, Gateway Plaza Access Rd, Melaluka Rd, Bellarine Hwy, Ormond Rd, Sydney Pde, Ryrie St, Moorabool St, Malop St, Mercer St and Railway Tce to Geelong Station. 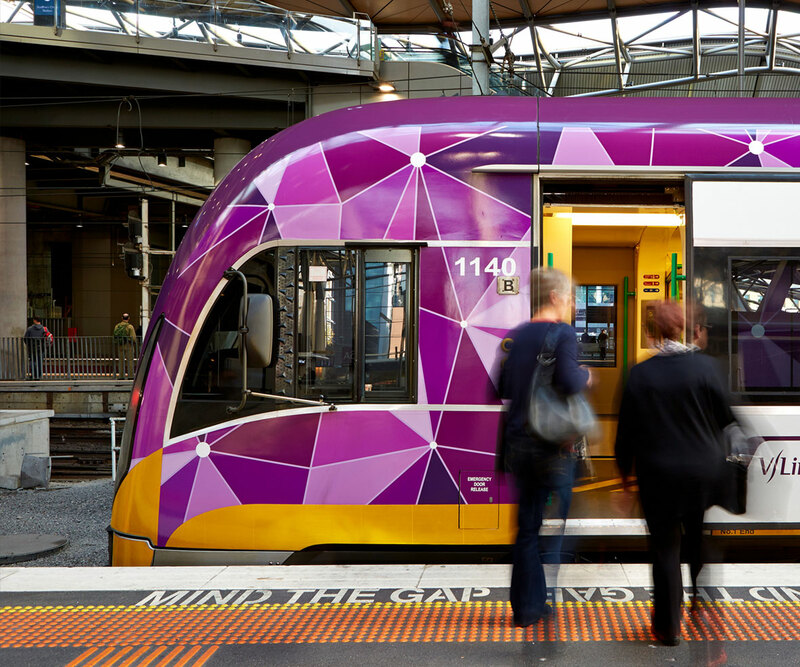 V/Line operate the train services between Melbourne and Geelong. The above link will open their web site in a new page. To find the Geelong train timetable, go to the timetables section. Buses operate to a Saturday timetable on public holidays except Christmas Day and Good Friday when a Sunday timetable shall apply. Services marked with this symbol are operated by wheelchair accessible vehicles except in unforeseen circumstances. This may not apply on school holidays, please contact McHarry’s Buslines on 5223 2111 to confirm. Click here for more details of our wheelchair services. When using our services, we want you to be safe. Here are some tips that may assist you in making your trip more enjoyable. There are a number of things that you can do to make your bus journey safer and more secure. Public transport is a fun and easy way to travel around Geelong with children. Children aged four years and under travel for free right across Victoria. When travelling with a pram, hold on to the pram and make sure your child is strapped in securely. Apply the brake to prevent it from rolling. If you require a large print timetable, they are available free of charge via Public Transport Victoria on 1800 800 007 (6am to midnight).